Many of my readers have been wondering what BUZZ COCOA is exactly. Some of you have googled, some of you have purchased, but many of you are still left in the dark. So what is BUZZ COCOA? BUZZ COCOA is an ingenious blend of caffeine and hot chocolate. It comes in multiple flavors, but all three have the same delicious taste and caffeinated experience you want. BUZZ COCOA is not intended for children or anyone under the age of 18. It is encouraged that customer discretion be used when creating your favorite BUZZED beverage, and to exercise caution in consuming larger quantities than suggested. Each serving size is (2) scoops (included in the packaging) which equals out to about 1 Tbsp (17g). BUZZ offers approximately 20 servings per pouch and for only 72 calories per serving! The product currently has just 11g of sugar – much less than any leading mocha / chocolate / flavored coffee beverage. On the ingredients side, we do include whey powder, but are also in the process of trying to move towards a lactose free alternative for those who have intolerance issues. We already use a non-dairy creamer made of coconut and soybean oil. Additionally, many have asked about BUZZ and if it is gluten free. Currently none of our ingredients are shown to cause inflammation of Celiacs Disease, but we have not obtained the Gluten Free certification (as of 12/12/2016). We are currently in pursuit of this certification, as we are of many, and hope to continually update our customers both via our website, emails, and the blog. If you haven’t felt it yet, the Winter has arrived. The temperature will continue to drop, the chills will run through, and in some parts there will be snow. 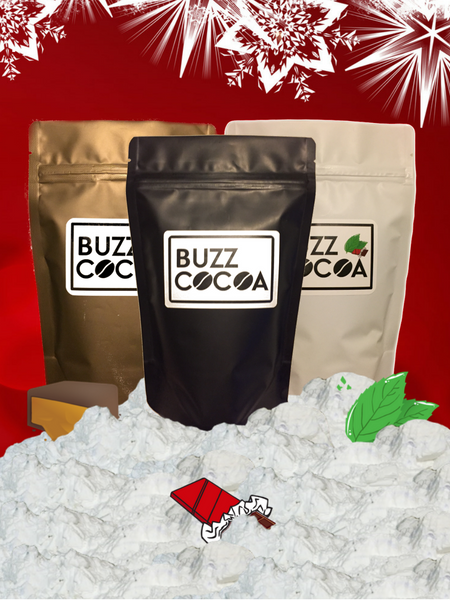 In order to keep you warm and cozy this holiday season, we’ve put together our BUZZ COCOA Holiday Bundle. A perfect gift for the hot chocolate lover in your family, the Secret Santa in your office, or a treat for yourself. This is a LIMITED Holiday Edition! Combining all three of our winter flavors, our Holiday Bundle is a great gift & treat! We’ve got Original BUZZ, Salted Chocolate Caramel, and Mint Chocolate. My mouth is watering just thinking about them! CAFFEINE + COCOA. There isn’t a world that gets better than that! Enjoy a delicious cup of Salted Chocolate Caramel as you sit by the fire or watch your favorite movie. Grab a cup of Mint Chocolate as you make some yummy snicker-doodle cookies. Or perhaps invite over a few friends and break out the original BUZZ – because you can never go wrong with the classic caffeinated hot chocolate. And for those of you who have just begun reading, you might be asking yourself – what is BUZZ COCOA? 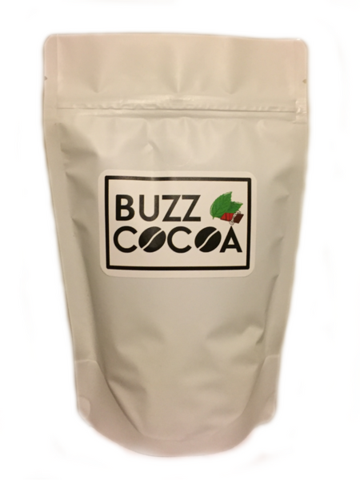 BUZZ COCOA is an ingenious blend of caffeine and hot chocolate that will have you energized and more productive after the first sip. Blended to perfection, each serving of BUZZ COCOA contains the same amount of caffeine as a typical cup of coffee. With an exceedingly rich taste, and for a quarter of the calories, BUZZ COCOA will put any fancy $4 latte to shame. Another month another flavor. For this December, we’re lining up a fresh breath for BUZZ. That’s right, we’re getting minty – Mint Chocolate to be exact! BUZZ COCOA Mint Chocolate makes a superb return to the caffeinated hot chocolate landscape. Brought back due to popular appeal last year, we’re hoping to revolutionize your winter with this BUZZ COCOA classic. Last year, we sold out of Mint Chocolate in a matter of days. We had to restock in the blink of an eye, and then once we made sure enough was available on hand, we continued to sell through February. A lot of you mentioned in your orders that Valentines Day was made extra minty – we were absolutely honored by that. So it’s safe to say that BUZZ COCOA Mint Chocolate is here to stay. Now enjoy a wonderfully spiked mint chocolate from your friends here at BUZZ COCOA.